this is my first journal entry. a little bit about me.i am a student at a local community college. i live in a small house with 2 or 3 other people ( i haven't seen one of them for along time, its been so long i can't quite remember what he looked like, i think he might have died).i have a little basenji. that is not a disease, it a breed of dog. 7:31p My roommate, whom i figured was dead, may be home. his car is parked outside but there is no other evidence of his presence. strange...maybe one day i will see him and all will be explained. Someday, i will lead a revolution that will bring humanity into the next era. Do you want to know what Tennyson’s favourite line of Shakespeare was? No? Well I’m going to tell you anyway. Actually, and despite the fact that what I’ve quoted there is a perfectly serviceable pentameter line, in the original it’s actually two half-lines. Imogen, or (since modern editors are adamant that the ‘m’ is a misprint in the Folio) Innogen, Shakespeare’s most complete example of an actively virtuous wife and woman, has been reunited with her husband Posthumus. 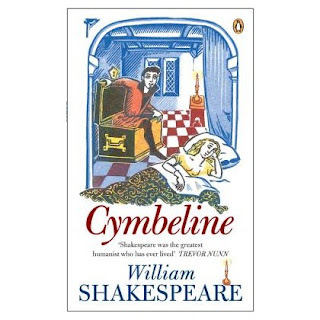 Poor old Posthumus had been banished by the King, Cymbeline (Innogen’s father) for having the temerity to marry his daughter. If that weren’t bad enough whilst he was away he’d gotten himself fooled by several people. First, he was tricked by a friend into believing that his wife had committed adultery (which she hadn’t); and then, after losing his self-control and ordering his servant to kill Innogen for her betrayal, he was tricked by his servant into believing that she was dead (which she wasn’t). He repents his rage and decides to forgive her, but by then he believes it’s too late. There’s a deal of romance-storyline complications over and above this, rather more, indeed, than can be digested by any ordinary audience in the course of a five-act play; but we end up in the final scene with all the key players on stage revealing the true identities underneath their various disguises and tying up every single one of the myriad loose ends. Innogen has been passing herself off as a man at this point. Her disguise is so good, indeed, that even her husband has not recognised her. Thinking she’s a page he throws her away from him, knocking her down. When the true identities are revealed they embrace, and this is where the lines come. INNOGEN: Why did you throw your wedded lady from you?